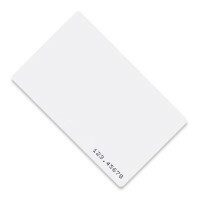 IL-06 card of ISO form-factor (ISO/IEC 7810 ID-1) or "thin" card is affordable proximity card for using in access control systems. The card has protection from the electromagnetic fields and static electricity. Personalization is performed by thermal printing, screen printing or offset printing.